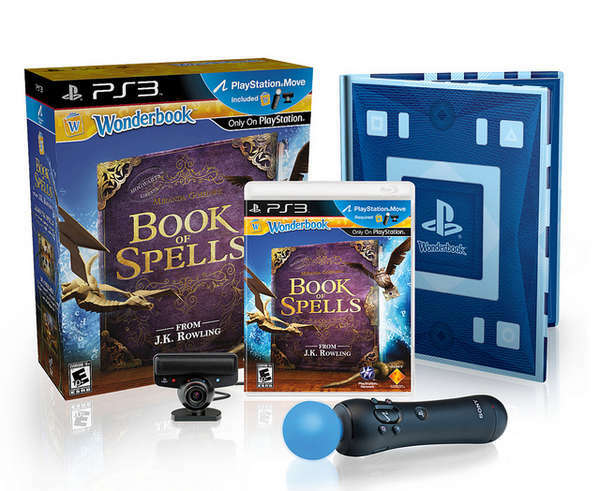 The Wonderbook Book of Spells for the Playstation 3 is a wonderful interactive game aimed mostly at children and families which whisks you away into a magical world all from the comfort of your living room. The game itself is easy to set up, once you have the Playstation move controller and camera, you simply plug them into the console and then enter the game itself. You can choose whatever Hogwarts House you want to join or you can connect via a Pottermore account which some of the bigger Harry Potter fans may favour. You’re then ready to begin your journey learning from Miranda Goshawk's Book of Spells, or if we strip away the magic, then you have yourself a big blue augmented reality PS3 ‘Wonderbook’. Having never played an interactive game or using Playstations move controllers and camera, I was pleasantly surprised to see how well it worked. As I mentioned before, the book itself is a big book of blank blue pages, with funny shapes on them, which I learnt are the tracking areas for the camera, and so when you appear on screen, you are surrounded by the interactive and immersive world and the book in your hands is actually transformed into the Book of Spells on the screen. The move controller also turns into your own wand, and so when it comes to playing the game and performing the spells, you see yourself with a real time book and wand which you are able to read, (or you have the option for the computer to read aloud for you) learn and subsequently put into action. The game is aimed at children, but this blew me away and I’m what you’d consider an adult now. The game itself seems to be the first of its generation and promises more to come. There are 5 chapters to read, and 20 spells to learn. This works by reading each chapter, turning each page of the book to move on, but only once you have learnt and performed the spells from that chapter. The interactive element comes from pointing the controller/your wand, at the screen and following the specific instructions whether it be flicking your wand to perform a Lumos spell, or waving it around as directed for another spell like Aguamenti. Your knowledge is tested the whole way through, and as some may think this could be laborious, it is quite the opposite as there are certain challenges, like battling away devils snare, and so this really does keep the ‘challenge’ in the game still there whilst being educational at the same time. Older generations of children will prosper more I believe, as some of the wand movements are quite tricky, and so younger children may not get the hang of it, but the game itself is still wonderfully rich enough to keep them entertained. Even though the game is Sony and lacks the Harry Potter name, Harry Potter fans will not be disappointed as the game itself takes place in Hogwarts. As you play, each learning experience relates to a different part of Hogwarts, so in certain parts it will be like being a student at Hogwarts, you have your house, and your Pottermore account membership, you learn the spells, and are you rewarded with house points. What is also great about this game is the small details, hidden beneath the surface, there are small tidbits about the spells themselves and who created them (All extra content from Rowling) and therefore the opportunities to learn more and earn extra points. So whatever your age, this game is an immersive opportunity to learn and explore further into the Pottermore world, and also gives us the chance to really go back to Hogwarts, and learn more about the world which we love. Wonderbook: Book of Spells, exclusively for Playstation 3 and out now, can be ordered at Amazon.com or Amazon.co.uk.